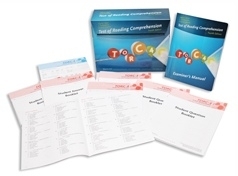 The Test of Reading Comprehension – Fourth Edition (TORC-4) is an innovative approach to testing silent reading comprehension that can be used to (a) identify children and adolescents who score significantly below their peers and who therefore might need help in improving their reading proficiency and comprehension, (b) document student progress in remedial programs, and (c) serve as a research tool in studies investigating reading problems in children and adolescents. It was normed on 1,942 students in 14 states. The test has five subtests, all of which measure word identification and contextual meaning. Studies in the TORC-4 manual indicate that the test has high reliability and strong validity, especially criterion-prediction validity. Relational Vocabulary – From the Student Question Booklet, the student reads a set of three words that are in some way related to each other. The student is to then silently read another four words and choose two words that are related to the first set of three words. Sentence Completion – From the Student Question Booklet, the student silently reads a sentence that is missing two words. The student then silently reads a list of word pairs and chooses the word pair that best completes the sentence. Paragraph Construction – After silently reading a list of sentences that are not in logical order, the student must then rearrange the sentences to form a coherent paragraph. Text Comprehension – Students silently read a short passage and then answer five multiple-choice questions relative to the passage. The five subtests are combined to form a composite called the Reading Comprehension Index, a standard score with a mean of 100 and a standard deviation of 15. This index represents students’ ability to understand contextual printed material. The number of subtests on the TORC-4 has been reduced from 9 to 6, which makes the test more streamlined and time-efficient for administration and scoring. All new normative data were collected in 2006-2007. Study of item bias has been expanded. Reliability coefficients have been computed by age and subgroups within the normative sample. All new validity studies are reported, including a rigorous analysis of TORC-4’s sensitivity and specificity. Vocabulary in the subtests have been updated. Floor effects have been eliminated. The overall look of the test has been updated and enhanced. COMPLETE TORC-4 KIT INCLUDES: Examiner’s Manual, 50 Examiner/Record Forms, 25 Student Question Booklets (28-Pages), and 50 Student Answer Booklets (8-Pages), all in a sturdy storage box.